The remains of the section of the school that was gutted by fire. 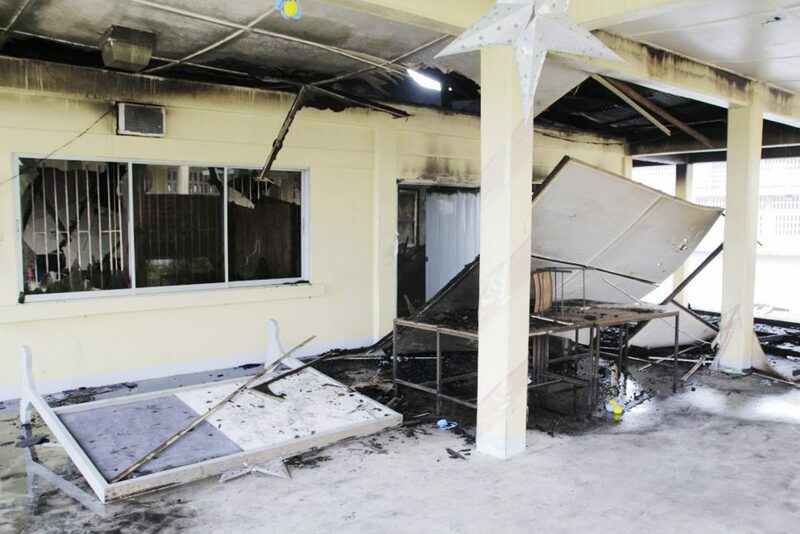 Guyana Fire Service (GFS) investigators have determined that the fire which destroyed the Administration building of the Diamond Secondary School, East Bank Demerara on Christmas Eve was an act of arson. This was confirmed by Fire Prevention Officer Andrew Holder who told Stabroek News on Monday that the investigation has concluded and the matter handed over to the police. “It has been handed over to the police and the police will carry out their investigation to determine as to who did it and for what reason or purpose,” Holder said. Stabroek News had reported that at around 1:30am on Christmas Eve, security guards on duty noticed fire emanating from the building. An alarm was immediately raised and the GFS was summoned. The administrative section of the building housed the offices of the head teacher, the deputy head teacher and teachers, along with the computer laboratory and library. Residents in the area had recalled being awoken by screams alerting them of the fire. Upon checking, they had said that they noticed smoke coming from the school. A source close to the investigation had previously informed this newspaper that from all indications, it appeared as though the fire was deliberately set. Just weeks prior, a similar incident occurred at the school whereby fire was set to the headmistress’s office. However, that fire was quickly brought under control. The Ministry of Education, in a press statement, had said that checks were also made by the GFS and these revealed that there was no power surge affecting the area at the time of the fire. The Ministry had noted that no other building situated in the compound was damaged and as such, school will reopen as per schedule in the new term.